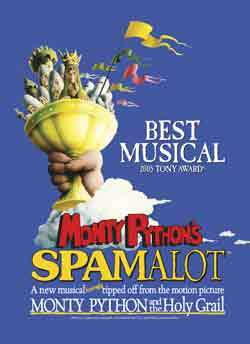 Monty Python's Spamalot has been touring the UK for over a year and has just finished a limited season at the Harold Pinter Theatre. It is now due to open at London's Playhouse Theatre with previews from November 14th, opening on November 24th where it will play through April 13th 2013. The full cast has just been announced with Stephen Tompkinson/King Arthur: Anna Jane-Casey/Lady of the Lake: Todd Carty/Patsy until 24th November then Michael Burgen: Graham MacDuff/Sir Lancelot: Jon Robyns/Sir Galahad: Robin Armstrong/Sir Bedevere: Rob Delaney/Sir Robin and Adam Ellis/ Prince Herbert. They will be joined by ensemble members James Nelson, Chris Jenkins, Hannah Malekzad, Rachel Knowles and swings Paul Bullion, Matthew Russell-Jones, Graham Newell and Amelia Adams-Pearce.